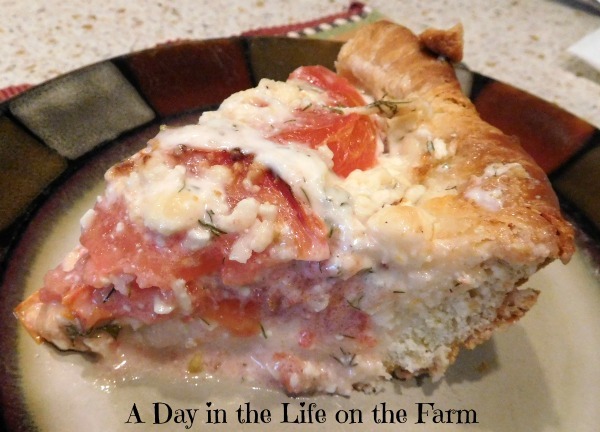 Our friend, Coleen, of The Redhead Baker invited all of us to celebrate today by baking a pie. We, here in blog land, celebrate Pi(e) Day each year on this date, 3.14, because any excuse for pie, right? This year I decided I wanted to go savory instead of sweet. When we were on vacation in North Carolina a couple of years ago, I had ordered a tomato pie at dinner. I have been meaning to make one ever since so this was the perfect opportunity. I conducted a google search and found this recipe from Bon Appetit. I adapted it very slightly, both in the technique than the ingredients. 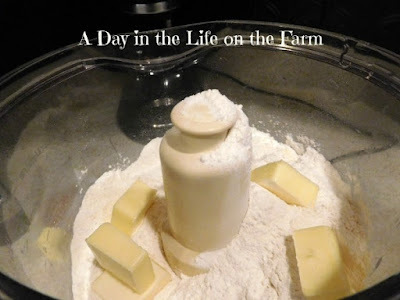 I used a food processor to make the crust instead of cutting the butter in by hand. Once the dough came together, it was wrapped in plastic and put in the refrigerator to chill for an hour. I sliced up the tomatoes, placed them on paper towel, covered with a couple more layers of paper towel and let them drain while the dough chilled. 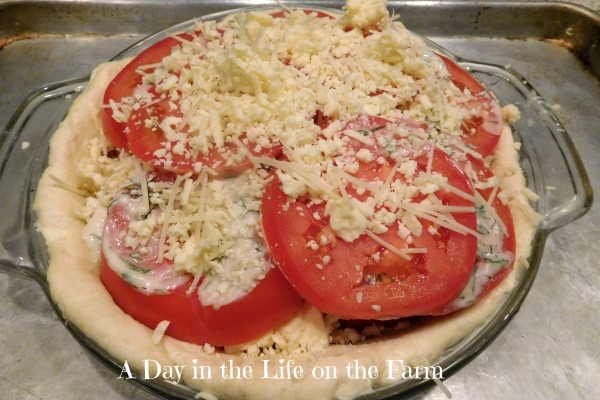 I also used this time to grate the cheeses and make up the sauce for the pie. It seems like there are a lot of steps to this dish but it all comes together rather quickly at the end. Remove the dough from the refrigerator and roll between two pieces of plastic wrap into a round disc. Place into your pie dish and press into the bottom and up the sides so all surfaces are covered. Sprinkle some cornmeal on the bottom to absorb any moisture. Now it is just a matter of layering. Start with a third of the cheese mixture. Add a layer of tomatoes and then spread half of the sauce over the tomatoes. Another third of the cheese, another layer of tomatoes, the remainder of the sauce topped with the remaining tomatoes and cheese. Place onto a baking sheet in case there are drips and place in the oven to bake. It bakes up beautifully. I served this as part of a brunch buffet but it would be a perfect Meatless Monday meal as well. We are in the middle of Lent so if you practice abstaining and are not a fish lover this would make a wonderful Friday night dinner for your family. 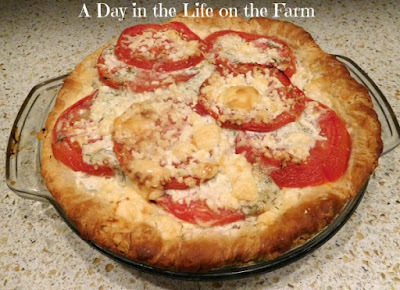 You will find all the other Pie Day offerings following the recipe for this savory and bright vegetarian pie. Place the flour, baking powder, baking soda and salt in the bowl of a food processor, pulse once to combine. Add the butter, pulse 2 or 3 times until coarse meal forms with some lumps. Add the buttermilk and pulse, 2 pulses at a time, until dough forms. Wrap dough in plastic and refrigerate for an hour while you prep the filling. 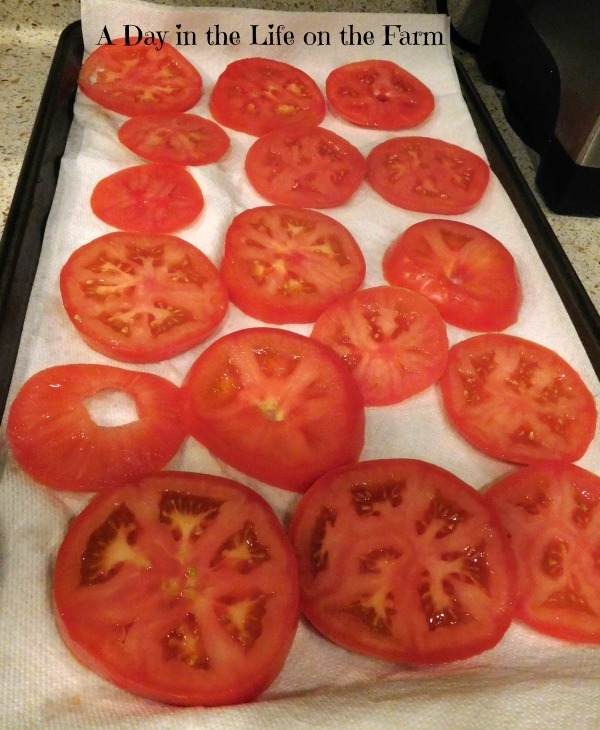 Core and slice the tomatoes into 1/4" slices. Place the slices onto a double layer of paper towel and then cover with another double layer of paper towel. Set aside for 30 minutes or more. Combine the cheeses in a small bowl. Set aside. 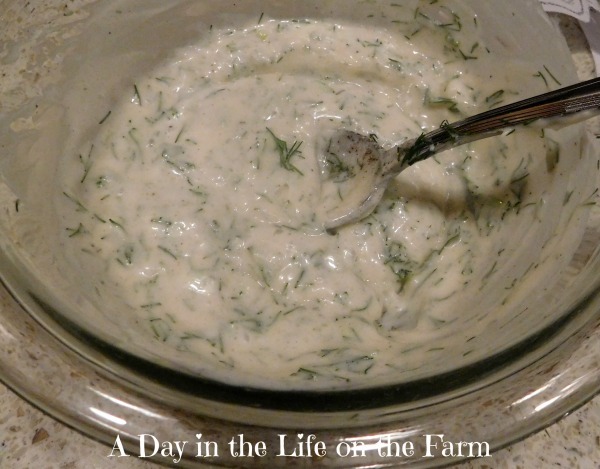 Whisk together the Miracle Whip, dill, vinegar, sugar, salt and pepper. Set aside. Remove the dough from the refrigerator. 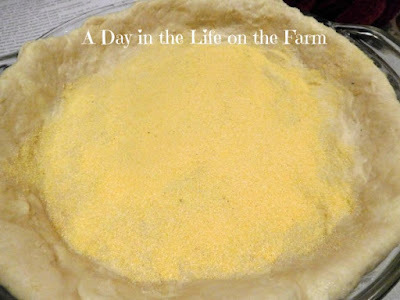 Place between 2 layers of plastic wrap, pressing and rolling into a round disc that will cover the pie plate. Place in the pie dish and press to cover bottom and up the sides. Sprinkle the bottom with the cornmeal. Sprinkle 1/3 of the cheese mixture over the bottom of the crust. Add a layer of tomatoes, overlapping as needed and then cover the tomatoes with half of the sauce. Add another third of the cheese, another layer of tomatoes and cover with the remaining sauce. Finish with the last layer of tomatoes and sprinkle with the remaining cheese. Thanks Nettie. It was delicious. Your pie looks delicious. We are having Chicken Pot Pie to celebrate Pi Day here! Chicken Pot Pie is always a welcome dinner around here. I'm seriously intrigued! It's like a pizza but a pie... it looks delicious! Yes, but with the slightly tangy and dill sauce it also reminded me a bit of spinach pie. Perfect for tomato season! My husband is growing tomatoes so I will save the for our harvest! 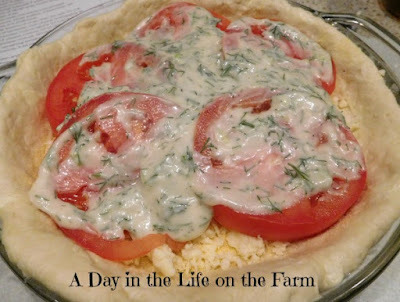 It will be even better with tomatoes fresh from the garden. 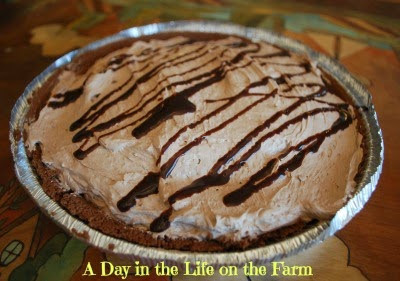 What a delicious looking pie! 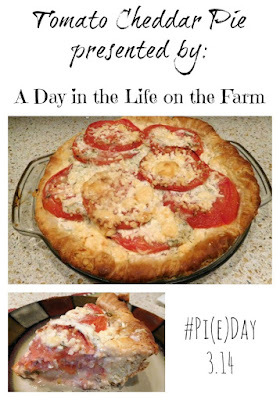 I have been wanting to do a tomato pie like this and now I REALLY want to! Let me know what you think Carlee.